The municipal People’s Committee and Lotte inked a deal on Tuesday to build the ECO – SMART CITY complex in Thu Thiem. The VND20.1 trillion (US$885.46 million) project is expected to break ground within the third quarter of 2017 and take six years to complete. Spanning 7.45 hectares in Thu Thiem, the complex includes shopping malls and office buildings integrated into residential areas. Roads and other infrastructure surrounding the complex will also be developed by Lotte and be left under the authority of Ho Chi Minh City’s administration upon completion. The project will be one of Lotte’s biggest overseas investments, according to its chairman Shin Dong Bin. Four subsidiaries of the South Korean conglomerate will be involved in the development of ECO – SMART CITY, namely Lotte Asset Development Co. Ltd., Lotte Shopping Co. Ltd., Hotel Lotte Co. Ltd. and Lotte Engineering & Construction Co. Ltd. In his remarks at Tuesday’s signing ceremony, Ho Chi Minh City chairman Nguyen Thanh Phong welcomed Lotte’s decision to select the city as the destination for a number of its major overseas investments, including the latest ECO – SMART CITY complex. 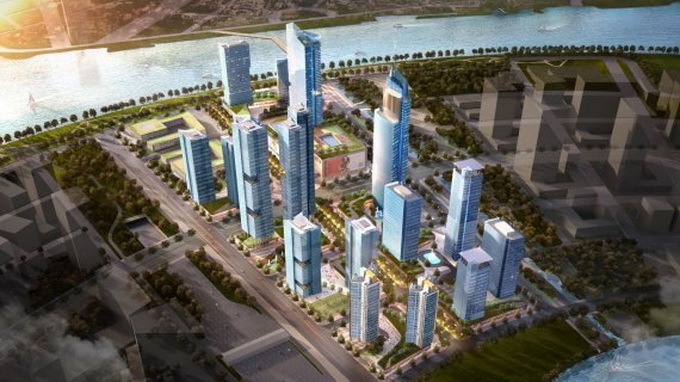 The chairman stressed Lotte’s commitment to the project, illustrated by the conglomerate having paid VND2 trillion ($88.11 million) in land rent to the city. According to the management authority of Thu Thiem, the smart complex will play an important role in launching the new urban area as a center of trade, commerce and services in the southern metropolis. The complex, it said, would employ state-of-the-art information technology in its management and customer service. The Thu Thiem New Urban Area is located along the Saigon River in District 2, which lies to the east of the city, and is connected to District 1, District 7, District 9, and Binh Thanh District.